This entry was posted on December 18, 2015 by Texas Safety Supply. The statistical figures show that several workers face hand injuries every year. Hand injuries are the most common industrial hazards and are usually caused by using poor quality work gloves or no gloves while working with machines and tools. Hands, wrists and fingers are the areas which commonly suffer in accidents. With the right kind of gloves and rating level, an injury can easily be prevented. Let’s explore some factors which would help you to choose the right work gloves for your industrial purposes. Dexterity is an essential factor required for necessary performance. Poor dexterity delays the reflexes. A well-made glove providing poor dexterity is not a good option for workers. In the earlier times, the options were very limited. Nowadays, the performance level gloves are widely available and provides good dexterity and protection at the same time. There are gloves that are heat resistant and does not provide the protection against sharp objects. However, some are specifically designed for handling the metal and sharp object-based tasks. Ansell Hyflex 11-500 Assembly Cut Resistant gloves and Ansell 11-624 Cut Resistant Gloves are good examples of it. There are certain glove types that are particularly used while assembling the automotive parts and mechanical components. These require a good amount of grip and oil resistance. Ansell Hyflex 11-600 Assembly Gloves is one of them. The material of the gloves should be chosen as per requirement of the industrial task. 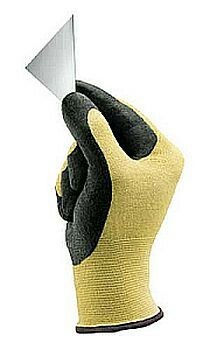 Canvas gloves are used for heat resistant properties while rubber gloves are used for resisting the current. Leather gloves are highly durable and possess good handling and grip for strenuous tasks while Kevlar and metal mesh work gloves are suitable for handling sharp objects and assembling the mechanical parts. Chemical resistant gloves protect the skin from harsh chemicals, acids and liquids. Ansell Hyflex Gloves series contain the gloves for all purposes. 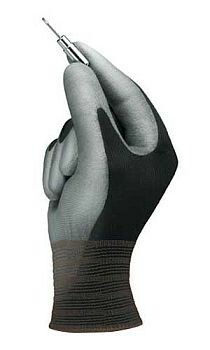 Work gloves are expected to provide a good amount of tensile strength and cut resistance. The levels may vary from 0 to 6. The higher the value, stronger the abrasion and cut resistance. Range varies from Latex to Metal Mesh in the upper range. ANSI and ISEA is the terminology used to rate the protection level in American standard while EN 388 is the European terminology. The gloves containing these ratings are considered industry standard gloves. It is a known fact that every industry thrives on the hard labor of their workers. It is the responsibility of the industry to provide them with the protective equipment and tools. An extreme hand injury is irreversible in nature and cannot be compensated in any form. Protective work gloves enhance the confidence of workers and make them more productive.